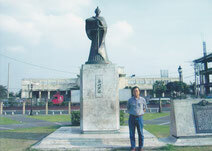 I wrote a blog in 2011 about the statue of Justo Ukon Takayama, located in Manila, the Philippines. Ukon with his family and associates were exiled by the Tokugawa Shogunate to the Philippines in 1614 at the time of Christian persecution in Japan. He kept his Christian faith and died there soon afterwards at the age of 63. This time, I would like to depict the life of Ukon Takayama. How did he manage to keep his faith in spite of persecution that took away all he possessed, and even threatened his life? First of all, let’s go back to the period in which he was born in 1552. It was during the final decades of the Muromachi Shogunate, which was pathetically struggling to remain in power. Already, a number of prominent warlords had embarked upon expanding their territories and formulating alliances to enhance their influence: simply put it was the time when the stronger preyed upon the weaker. In this setting, Ukon’s father, Tomoteru Takayama, who was a relatively minor warlord, endeavored to survive under greater warlords one after another. It was also the time that saw energetic activities by Portuguese and Spanish missionaries in Japan. Under these circumstances, Tomoteru decided to embrace Christianity and was baptized along with his family. Because of Tomoteru’s eagerness to practice his belief, when he reached 50 years of age, he abdicated his lordship in favor of his son. It was, therefore, unquestionable that Ukon received tremendous Christian influence through his father. But was he such a saintly warlord? Not exactly. He was above all, a warlord who fought one battle after another. Because of his bravery coupled with an honest and modest character he managed to become trusted by other warlords. But it was not long before the new samurai ruler, Hideyosi Toyotomi, ordered the deportation of Christian missionaries in 1578, under the premise that they were not observing Japanese regulations and customs. Although the decree was not a ban on Christianity in Japan as such, it had a profound effect upon the Japanese Christians. For instance, a number of Christian warlords decided not to take any chances so they hastily denounced their Christian beliefs. What about Ukon, how did he react? Well, his decision was simple: he abandoned all he had, his power and wealth, and kept his faith instead. Ukon was fortunate enough that he and his family managed to live under the patronage of warlords who were sympathetic to Christian nobles. Then, there followed a number of martyrdoms of Christian missionaries and devotees; and the succeeding Tokugawa Shogunate took it a step further in the persecution of the Christians. 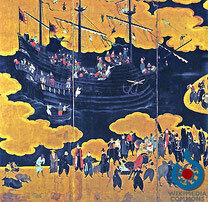 In 1614, the Shogun ordered the deportation of Christians, which included Ukon and his family. 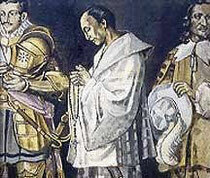 In Manila, Ukon was warmly welcomed by the Spanish colonial ruler. So, his last days in the Philippines were spent in peace and happiness. Having said that I would like to refer to a novel entitled “Ukon Takayama”, which was written by Otohiko Kaga, himself a Christian. Kaga depicted Ukon in Manila witnessing the plight of indigenous people under the Spanish rule. Incidentally, Ukon excelled at the art of tea ceremony.